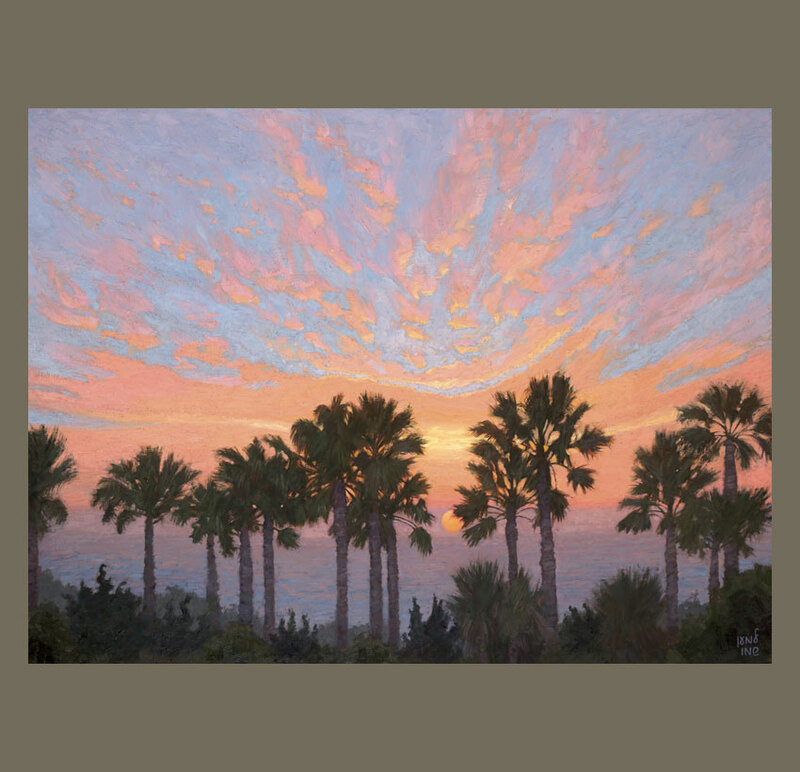 Cadieux’s painting, with its palm trees and sun setting into the Pacific Ocean, is all about California and our special light, and beautifully illustrates the book’s title. 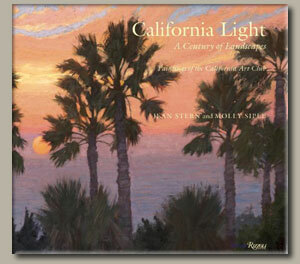 The eye-catching painting on the cover of the California Art Club’s soon-to-be released centennial book, California Light: A Century of Landscapes (Paintings of the California Art Club), is a dreamy, quintessential southern California scene by artist Cathey Cadieux. When Cadieux found out that her painting had been given this honor, she was absolutely thrilled, beside herself with amazement, and even a bit in shock. She humbly asked, “How did this happen? !” Here’s how. I also needed the subject matter of the paintings to follow the storyline I was writing, a tour of the state. I had to hunt for paintings showing views of Humboldt County near the Oregon border, but had loads of paintings to choose from for areas such as Carmel. At last, conferring with my co-author, I put together a large batch of painting images and submitted these to the publisher in New York, turning over the images to the editorial team back east for final selection. Works that they chose to illustrate the book’s text next became candidates for the cover. Rizzoli then took the lead in cover selection. This is standard procedure because cover design is product design. The publisher, editor, art director, and marketing department all huddle to come up with an image that will best illustrate the book’s title and theme, and also encourage a potential customer to walk over to a display in a store, pick up the book and buy it. Assorted points of view are aired and the process of selection can take months, as it did with this book. Hopefully though, in the end, and in this case, a great “marketable” cover is chosen. 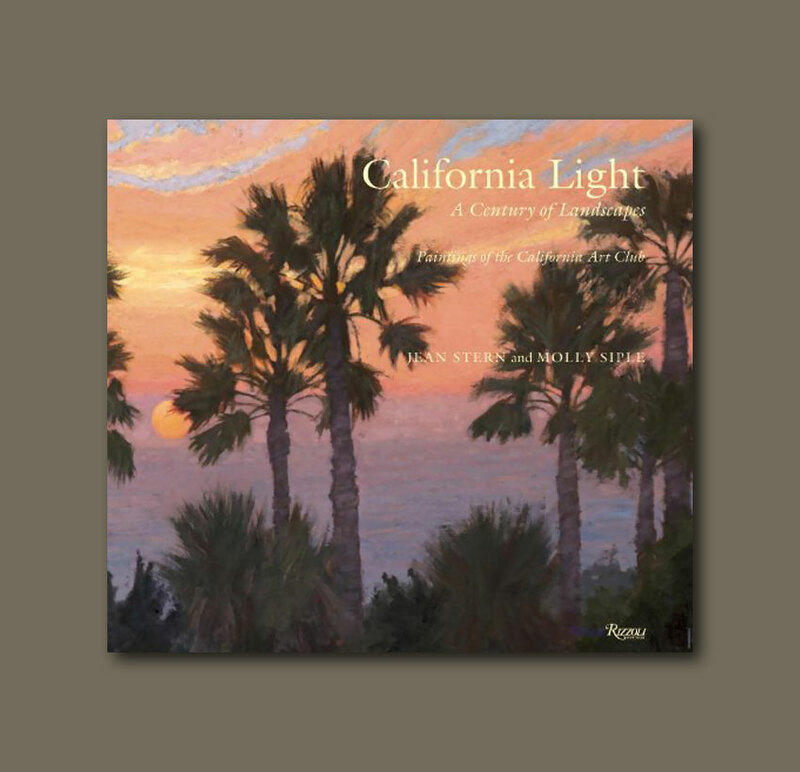 Cadieux’s painting, with its palm trees and sun setting into the Pacific Ocean, is all about California and our special light, and beautifully illustrates the book’s title. In addition, Cadieux’s simplified rendering of trees and clouds, according to the Rizzoli marketing department, is relatable imagery, helping make the book customer-friendly. Even the painting’s title is tantalizing: “Malibu Winter Sunset, View from My Bedroom.” Ah, that beautiful California lifestyle! Again, her cover painting makes a good example. 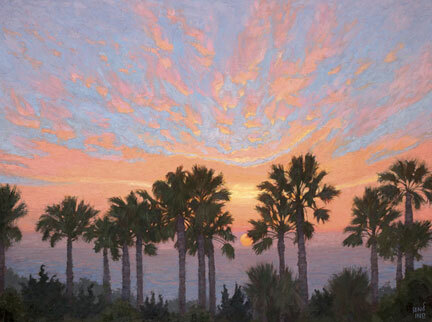 Cadieux’s arrangement of the palm trees in the foreground generates a lively rhythm while the artfully placed fan of clouds leads the eye outward from the trees and through the composition. In addition, certain colors in the actual scene are featured — orange, green, and purple — a triadic secondary color scheme, which she chose to create an overall colour harmony. As much as she is enjoying painting landscape, Cadieux is glad she came to this genre having first had a thorough academic education in portrait and figure technique, which stresses accuracy in representing light falling on form. Beginning in 1974, she attended the American Academy of Art in Chicago, where she studied under the tutelage of master instructors such as the legendary Bill Parks (who taught both Scott Burdick and Dan Gerhartz). After graduating with an Associate’s Degree in Fine Arts, Cadieux moved to San Francisco for additional studies at the Academy of Art College (now University), receiving in total five years of intensive education. She recalls, “During this time I totally dedicated myself to art. At nineteen, without the distractions of a family, pets, or hobbies, I just painted: five days a week, 9 to 5 at school, plus homework and painting on weekends. That kind of lengthy intensive study is what it takes to really master figure painting from life.” After her schooling, she returned to Tulsa and began a successful career as a portraitist. Another facet of Cadieux’s current work is her religious paintings. About ten years ago Cadieux, who was raised Christian, became interested in studying Judaism. Ultimately, she began attending a Messianic Synagogue because their form of Judaism embraces Yeshua (Jesus) as the Messiah. “I realized I wanted to say something with my art work about my new understanding that the entire Bible was a Jewish text,” she explains. With typical dedication and intensity, Cadieux delved into researching Biblical history, and learning to read and write Hebrew. “As I began to study Hebrew, I discovered it to be a highly visual language, far more so than English. Even the letters of the Hebrew language paint pictures.” Subsequently, Cadieux started including Bible verses written in Hebrew in her religious paintings. Among Cadieux’s other great passions is her love for horses. Cadieux first came to southern California in 1995 to work with Olympian champion, Hilda Gurney, in Moorpark, who could help Cadieux with a horse she had just purchased, Database, a Grand Prix dressage “schoolmaster” horse. The term schoolmaster refers to a top-level horse trained for the sport of dressage. The horse “teaches” a novice rider about how it feels to sit on an “educated” horse, one who knows all the right moves. Gurney encouraged her to check out the wonders of the California lifestyle, including the art scene. Cadieux repeatedly postponed her return to Oklahoma until one day she realized she was officially a Californian. Cadieux still has Database, who is now twenty-five, and rides him, along with her Grand Prix Spanish Andalusian stallion, Karuso. Today Cadieux’s home is her dream house in Malibu, with a view of the sea and stables just up the road. She is currently building a large art studio on her property where she will teach workshops and also organize classes taught by other accomplished artists. Cadieux has three decades of experience teaching portrait and figure painting, first in Tulsa, and later at the California Art Institute in Westlake Village. She has also taught portrait painting for numerous workshops associated with the Pastel Society of America and The Art Methods and Materials Show.